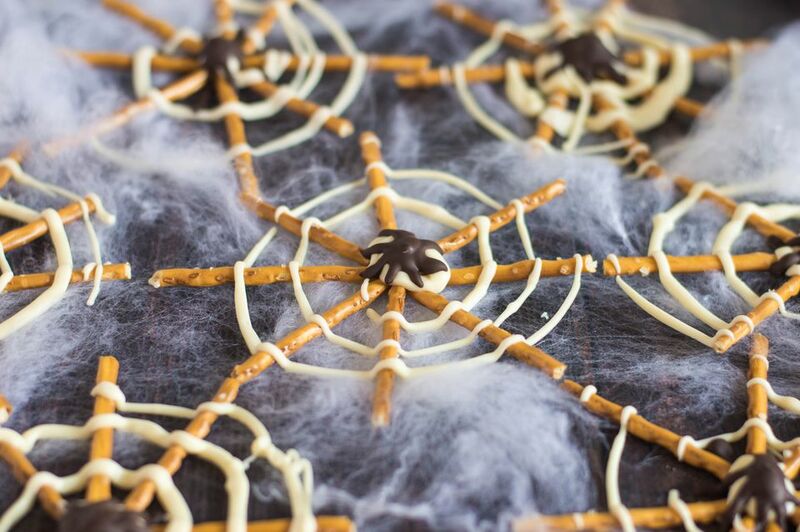 These Spiderwebs are an incredibly easy Halloween candy, and everyone will love the great combination of salty, crunchy pretzels with smooth, sweet white chocolate. If you don’t want to draw the spider in the middle of the web, you can place a raisin or chocolate chip in the center to represent the spider. Prepare two baking sheets by lining them with aluminum foil. Arrange the pretzel sticks in groups of eight, radiating out in a circular pattern. You should be able to fit about 6 groups to a baking sheet. Place the white candy coating in a large microwave-safe bowl and microwave until melted, stirring after every 45 seconds to prevent overheating. Scrape the melted candy coating into a large Ziploc bag and snip a hole in the corner. The hole should be about 1/8-inch thick. Alternately, you can use a pastry bag fitted with a small round tip, if you have one. Pipe a round dot of candy into the center of each pretzel group to bind them together. Starting from the center, slowly draw a spiral onto the pretzels, gradually working your way out to the edges of the pretzel sticks. The line of candy coating should be thin enough to look like a spider web, but thick enough to hold together as it drapes over the pretzel sticks. Once all of the webs are decorated, melt the chocolate chips for 45 seconds in the microwave. Stir until melted and smooth, and scrape the chocolate into a small Ziploc bag. Cut a very small hole in the corner of the bag. Draw the spider in the center of the web. I find it’s easiest to do the legs first: pipe eight very thin lines radiating out from the center. Finish the spider with a large blob in the middle for the body. Repeat with remaining webs. Refrigerate the webs for about 10 minutes, or until the candy coating sets. Carefully peel the foil off.